Let's say we have two groups of users on our site: Writers and Editors. Our Writers group is responsible for creating site content, and our Editors group is respnsible for managing a certain level quality assurance before the writers' changes "go live" on the site. 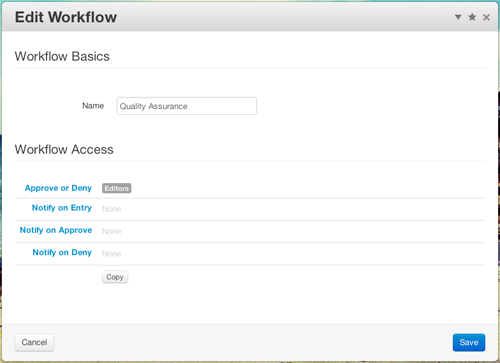 We want to create a workflow that helps manage that process. It will ensure that our Editors review changes prior to publishing, and it will make sure they're aware whenever a change has been submitted and needs review. 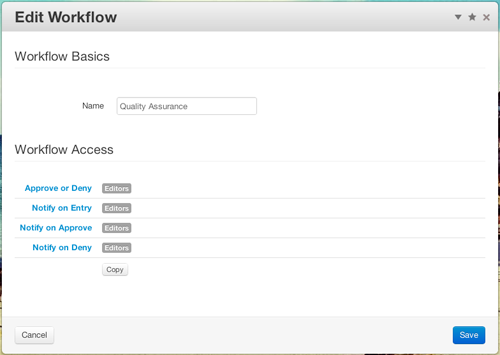 By default, concrete5 will have no workflows installed. To get started, let's add one. Go to Dashboard > Workflow > Workflow List and click Add Workflow. Give the workflow a name that represents the process you're building. We'll call this one Quality Assurance. Once the workflow has been created, we can configure how we'd like it to behave. 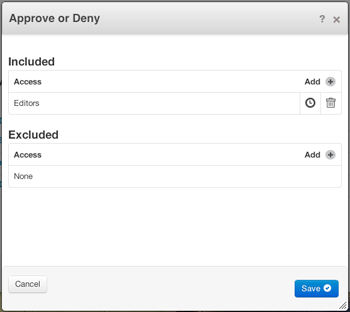 First, let's configure who has access to approve or deny changes submitted to this workflow. This will efectively give them access to publish or "make live" the changes on our site. Click the Edit Details button to continue. We can select any combination of users, groups and group sets to include or expressly deny from accessing this step of our workflow. Now let's set up some notification options. Since all of our Editors will likely want to know when something is in need of their attention, let's notify them whenever a new change enters the workflow, when a change is approved, and lastly, whenever a change is denied. 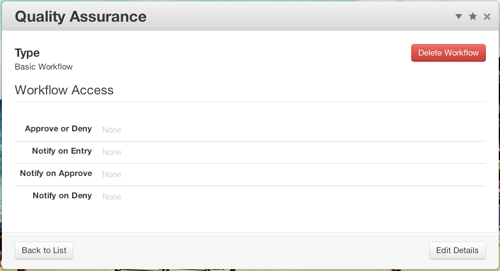 We'll click each type of notification and pick Editors from the available Access Entities. Editors will now receive email notifications whenever these workflow actions take place. Perhaps another group, Managers, wants to receive notification emails for this workflow as well. So we'll add them to each of these items in the Workflow List. 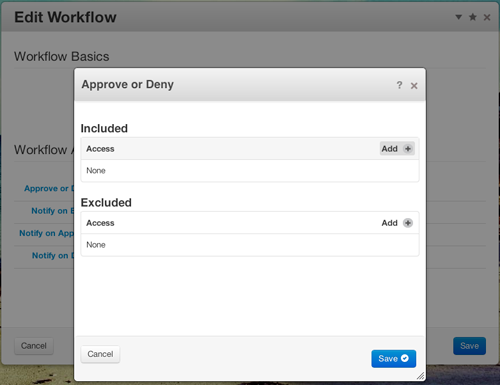 Natually, we can also exclude access to each item in our Workflow Access list. Let's say a member of our Editors group hasn't been making wise choices, and we want to revoke his priveleges. We can exclude his individual user account without lockout out the other users in the same group. His username will show up in red on our Workflow Access list. 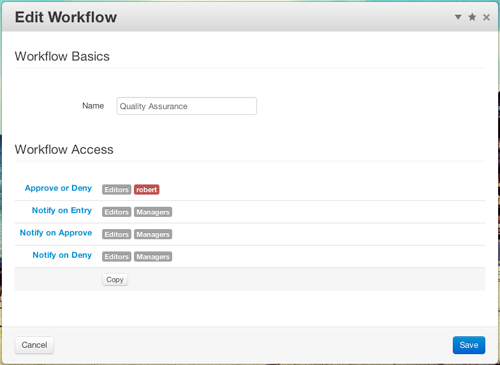 Now that we have our workflow created, we'll need to attach it to page permissions.